Two special medals earned last weekend. Above : Son’s school jogathon which both hubby and I entered, joining the Open category, “competing” with much younger ex-students of the school. A 5K of undulating route of Bangsar. It was a good warm-up run for Sunday’s race. 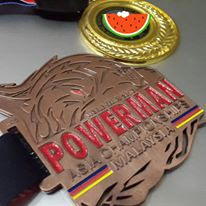 Below : Powerman Dualthon Relay medal. My first Powerman medal. Both are great, in their own way.